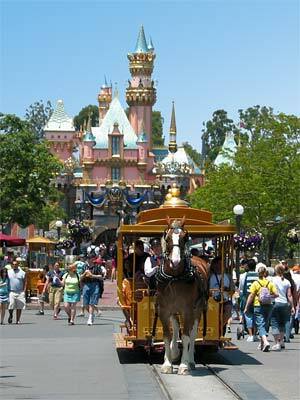 The first of Walt Disney's ventures, Disneyland Park (official website) is 85 acres of everything you love about Disney - from the whimsical characters that dominate the rides and roam the walkways to the sophisticated "animatronics" that wow visitors, no matter how many times they've been here. Disneyland Park is divided into Main Street and 7 additional distinct lands. There's a reason to visit each and every one of them. The pathway to the castle and all that's beyond, Disney designed Main Street to look like the principal thoroughfare of a small town. Here you'll find a number of shops as well as a few attractions, like Great Moments with Mr. Lincoln and The Walt Disney Story. Hop aboard a horse-and-carriage or double-decker bus for a ride down the street. Refurbished in the 1990s, Tomorrowland is meant to evoke the excitement of the future. The centerpiece of this land is the futuristic-looking Space Mountain, though kids will enjoy the Astro Orbiter, Autopia, and Buzz Lightyear's Astro Blasters. If you have kids in tow, you can't miss this portion of the park. This is where you can actually stand in line to meet and have your picture taken with Mickey and Minnie in addition to enjoying a number of kid-oriented rides (that can also be fun for parents!). For many, this is the best part of Disneyland. If you love the characters from Disney's classic animated features (such as Snow White, Pinocchio, Cinderella and others), then you'll love the rides in this land. 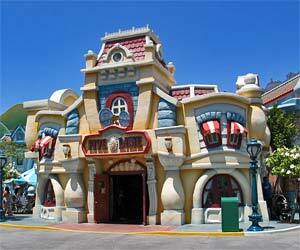 Perennial favorites include It's a Small World, Dumbo the Elephant, and Snow White's Scary Adventures. Don't miss Disneyland's signature ride, The Matterhorn, not found in any other Disney park. 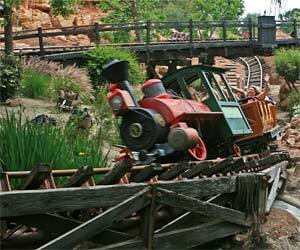 Also indicative of the Wild West, Frontierland's main attraction is the Big Thunder Mountain Railroad, which provides guests with a thrilling ride on a runaway mine train. Originally dubbed Bear Country, this land gives you that down-home Western feeling and is home to Splash Mountain, Disney's only log-flume type ride, featuring the loveable characters from Song of the South. Visit the jungles of Africa and other exotic countries as you enjoy attractions such as The Enchanted Tiki Birds, the Swiss Family Treehouse, Jungle Cruise, and the one-of-a-kind Indiana Jones Adventure - found only in Disneyland. 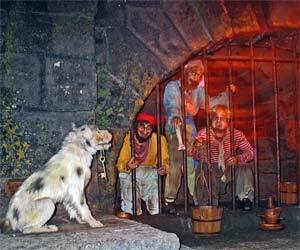 The crowning glory of this section is the New Orleans-style estate that houses Disney's famous Pirates of the Caribbean, as well as the Haunted Mansion. Interspersed amidst all the attractions are places to eat, shop, and rest. Always available to assist you are Disney's wonderful "cast members", who can always point you - with ease - to the closest changing station, water fountain, or ice cream stand.